Two young adults came into the library today looking for the oldest book we own. Cool question! They were doing a scavenger hunt put together by friends and family. How was I going to find what they were looking for? I started by searching our staff side of the OPAC. I know there’s a way to do an item record search and limit by publication date. Using this method, I searched for books with a publication date earlier than 1850. The oldest book in that results list is Pere Goirot and Eugenie Grandet by Honore de Balzac, published in 1834. That got me thinking, though. What about the Bible or other prominent religious texts? What about Shakespeare or Homer? They were written well before 1834, but all of our editions in the library were published after 1834. And the only way I can search the catalog is by published date. Can we even put an exact date on when some of these older classics like The Odyssey were first published? Maybe when the Gutenberg printing press was first invented. But what about a handwritten copy of a classic? That is surely a book just as much as a printed copy is. Now I’ve sunk myself deep into questions of “What defines a book?”, “Who wrote the first book?”, “Who printed the first book?”, “Does the true ‘first’ book even exist any longer or has it been eaten away by insects?” and so on. 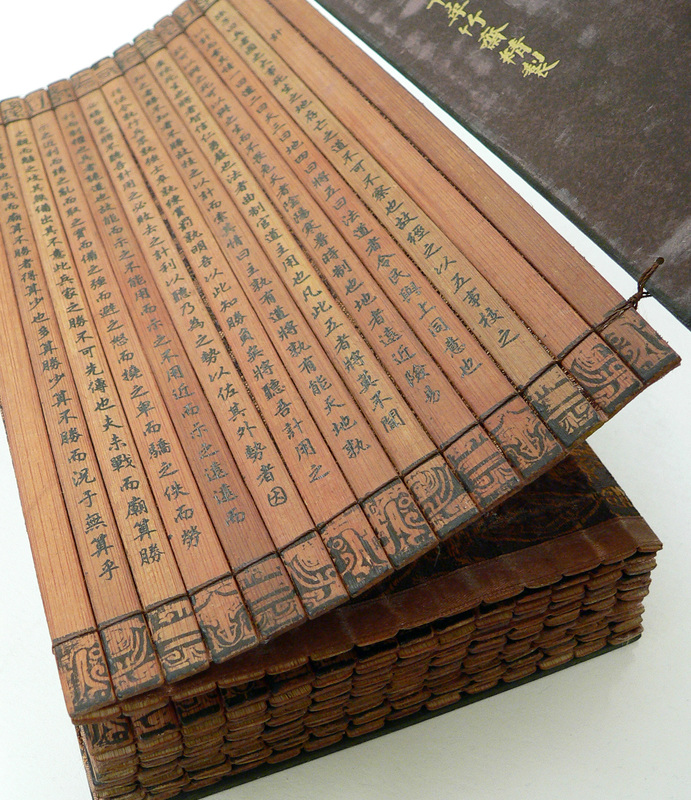 This bamboo book is gorgeous.Wax tablets were used by the Romans. Even little kids know about papyrus, which was first produced about 2,300 years ago. Once I start googling, I find I know very little about the history of books and their production. As a librarian, a steward of books and an advocate of reading, I am a little embarrassed for myself. I’ll have to find a book to learn more about it….